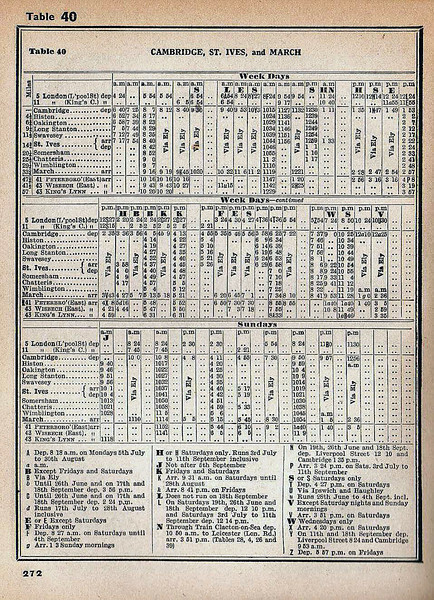 The Cambridge- St Ives-March timetable from the summer of 1954. Of interest is the column marked HN on the weekdays section which was a through train from Clacton to Leicester running summer Saturdays only. It took the Stour Valley line at Marks Tey via Haverhill then on to Cambridge and St Ives. It then took the Huntingdon East line to Kettering and up the main line to Leicester. The column marked J on the Sunday timetable is a through train to Hunstanton from Histon stopping at all stations to Wimblington. It then worked non stop to Kings Lynn via March, Wisbech and Magdalene Road.